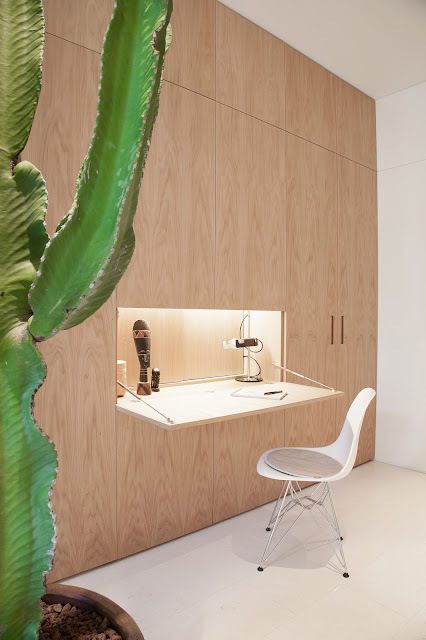 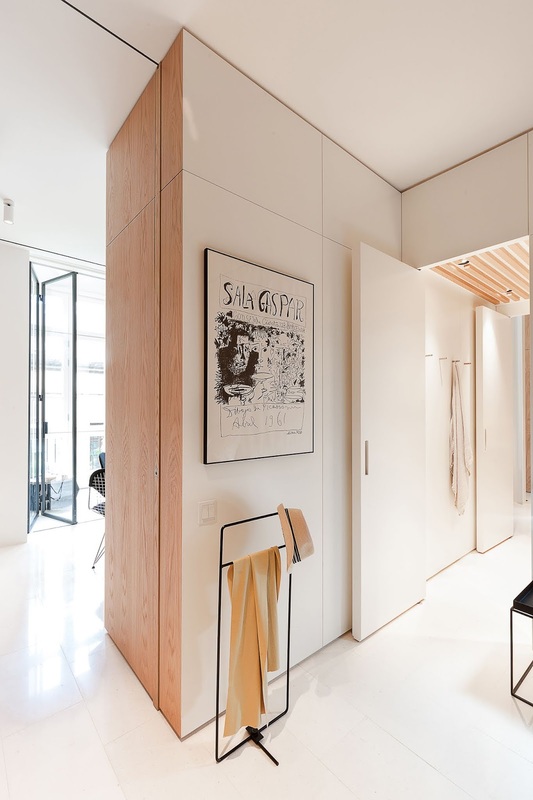 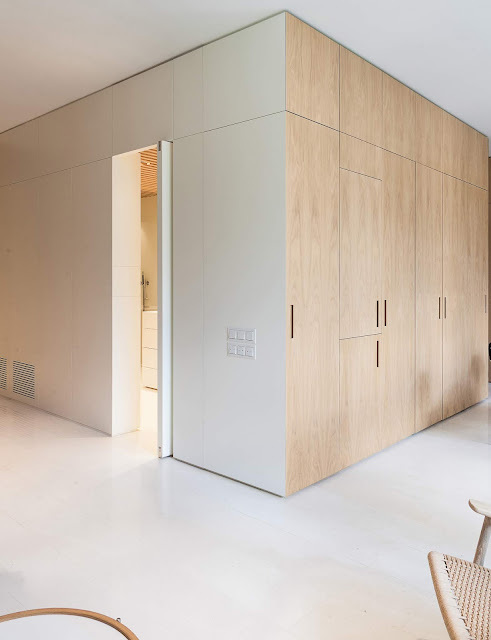 Barcelona based Spanish-German architectural design firm YLAB Arquitectos renovated a minimalist apartment in Barcelona’s Gracia district. 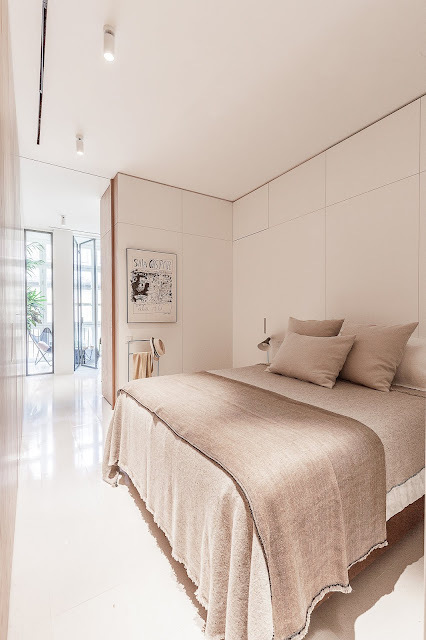 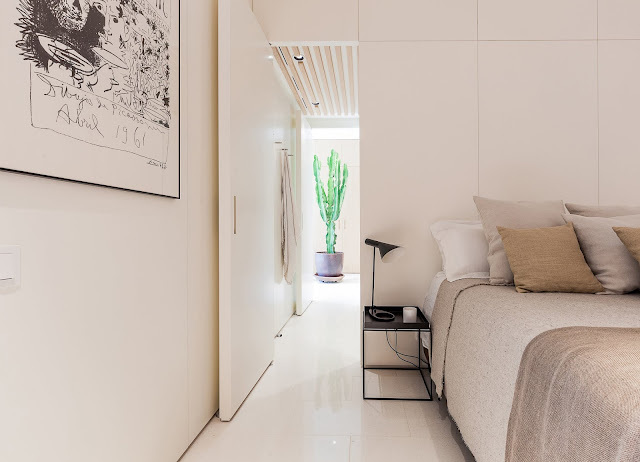 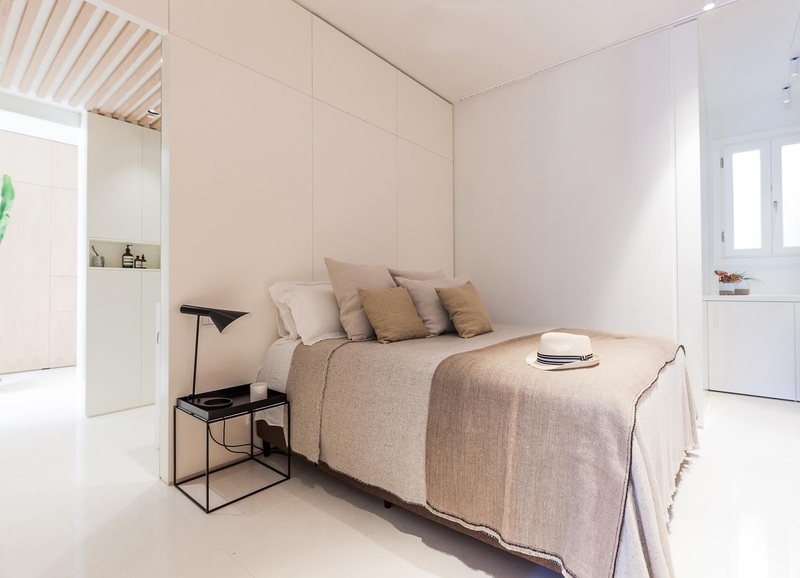 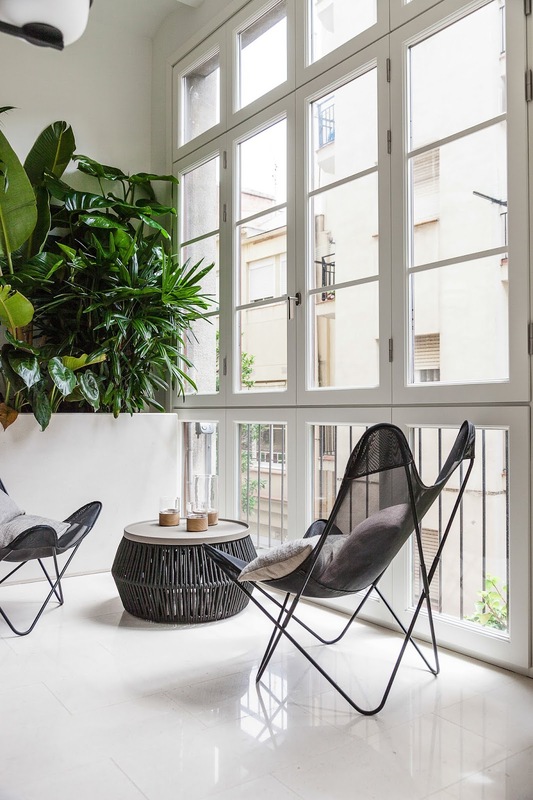 The project consists of the remodel of an apartment located in an old building in Barcelona’s Gracia district. 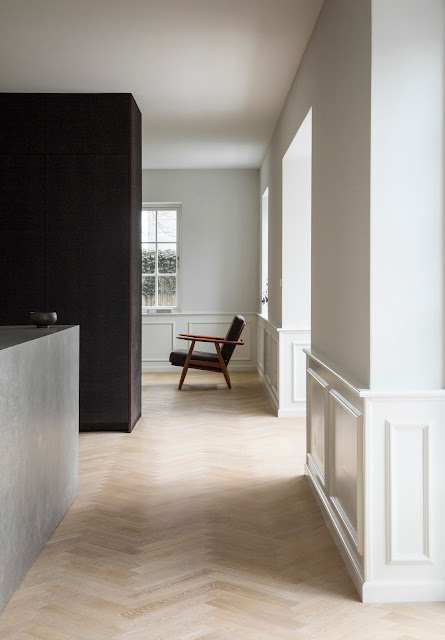 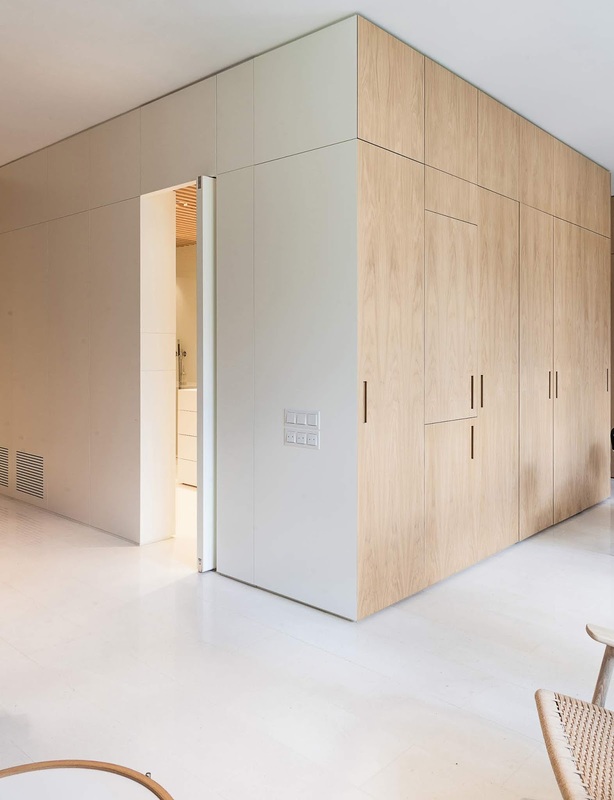 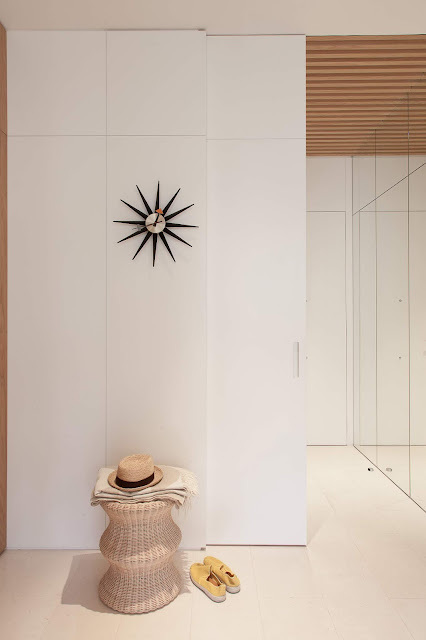 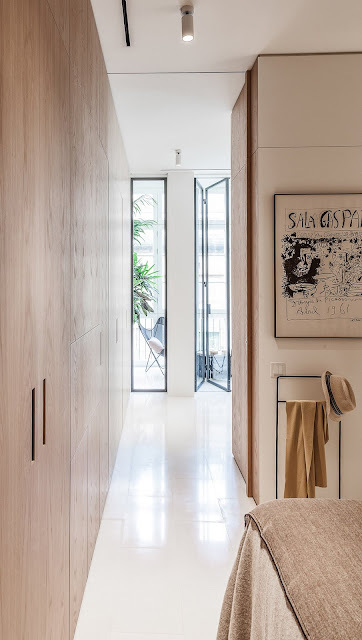 The former 90 m2 apartment, was heavily partitioned with up to 6 rooms and gave off a dark appearance with almost no connection with the outdoor space. 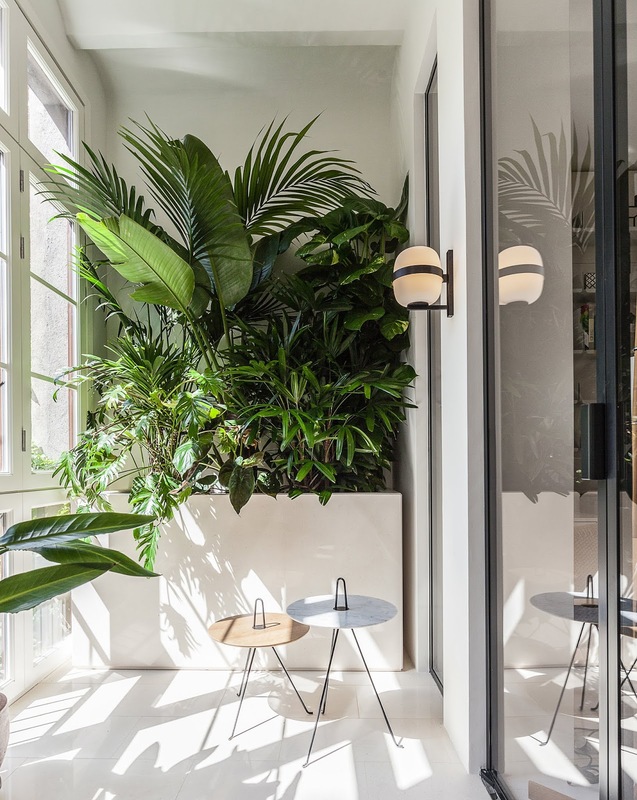 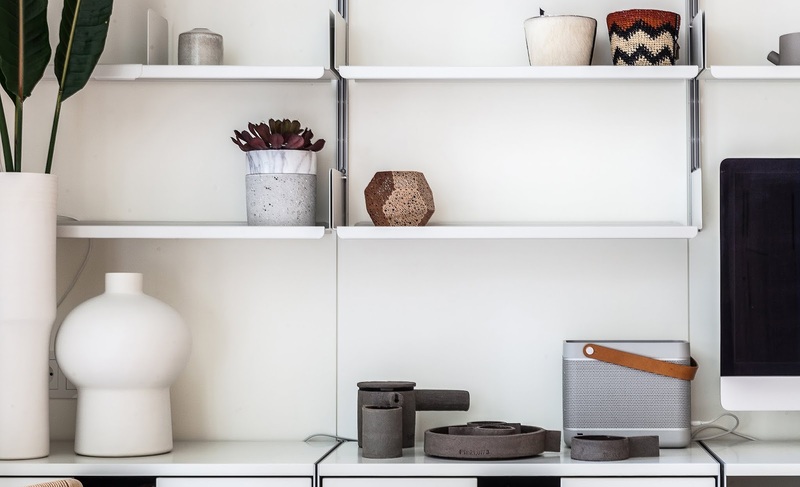 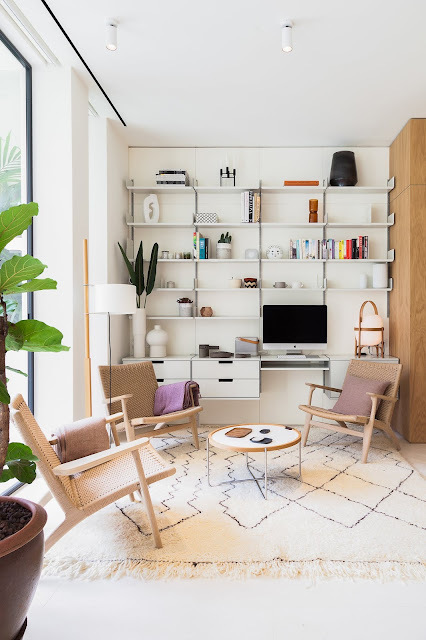 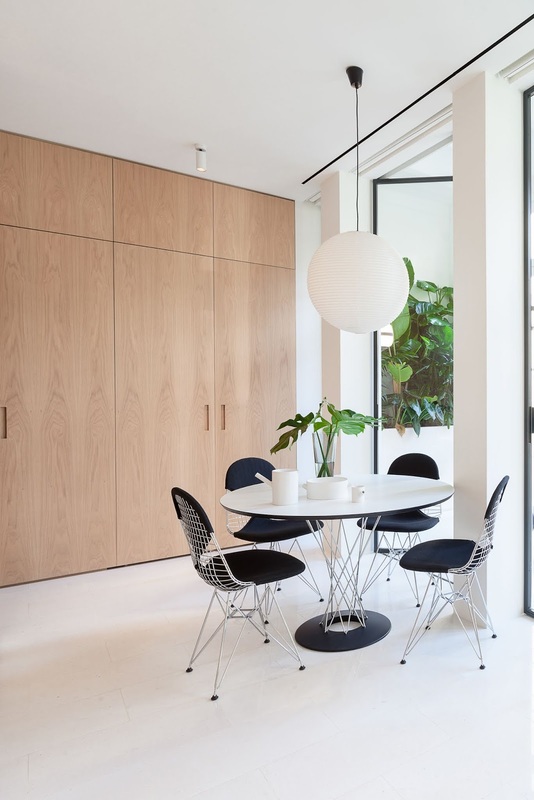 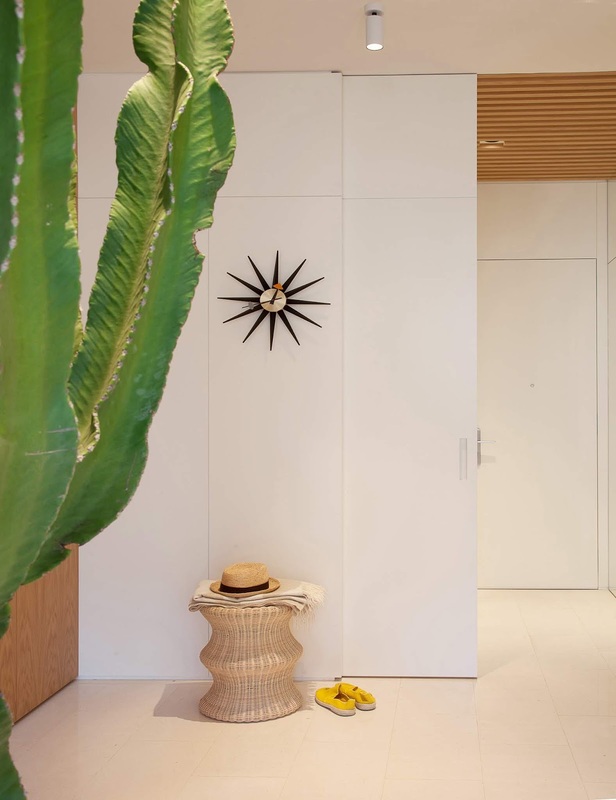 The new owners, a Norwegian couple in love with design and with the city of Barcelona, had understood the potential of its sunny inner courtyard covered with ivy vines, and chose to buy it as their holiday residence. 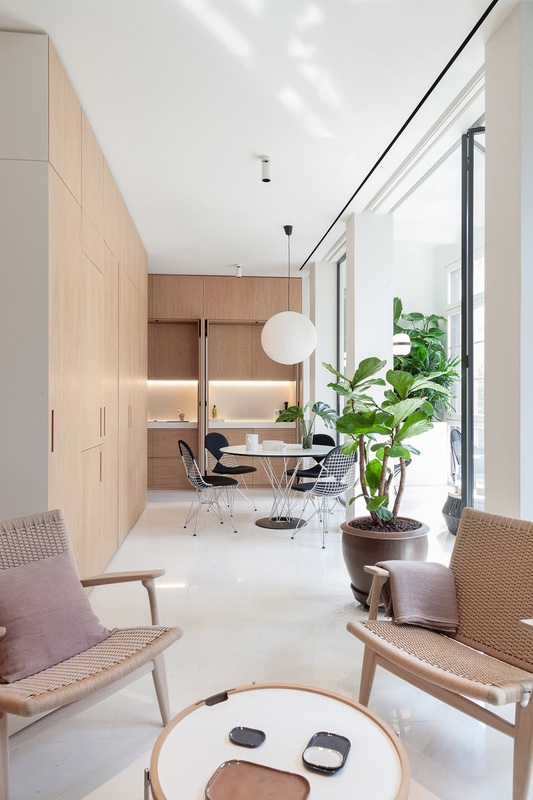 They wanted to transform it in a bright and open space and create a semi-exterior garden to overcome the lack of an outdoor space. well through a second door from the communal area, serving as guest bath. 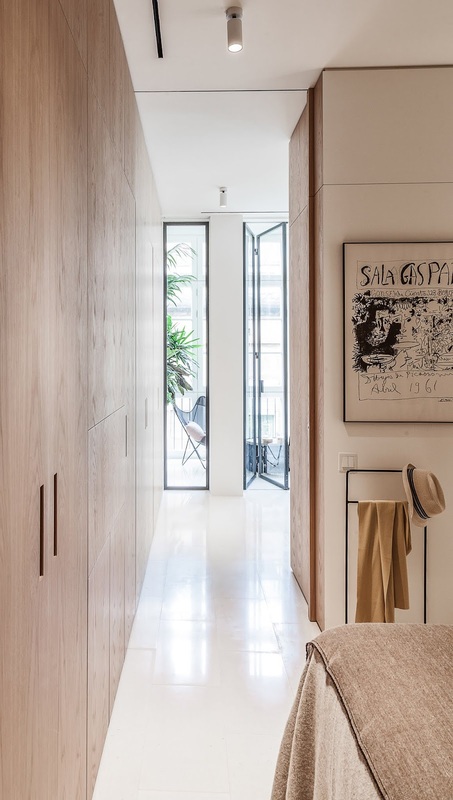 The layout concept is developed from the segregation of the classical functions into different subzones, more aligned to the owners’ particular way of living. 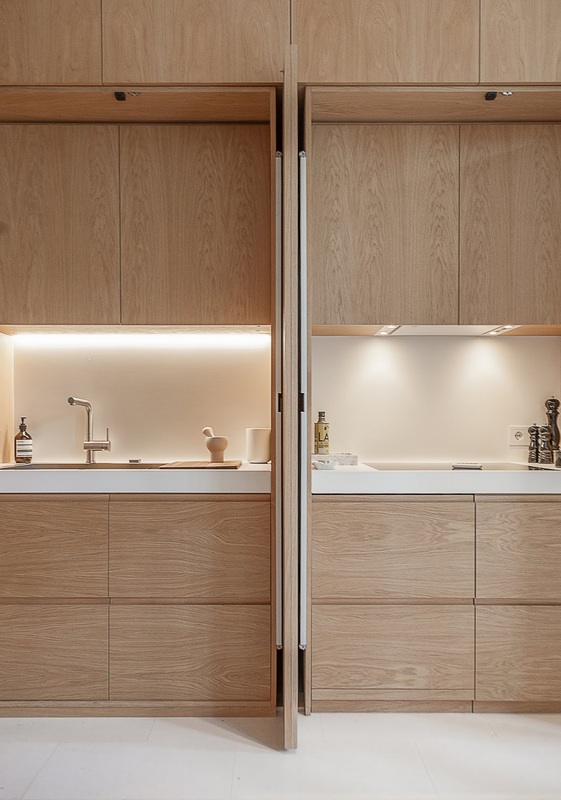 Thereby, the kitchen-dining is disintegrated into four sub-zones: the cooking and the washing zones, both in contiguous spaces inside a cabinetry at the front of the communal space; the breakfast zone, in a second angled cabinetry, with hidden space for little kitchen appliances and a removable worktop; and the winery/bar zone, in a third cabinetry closer to the living room. 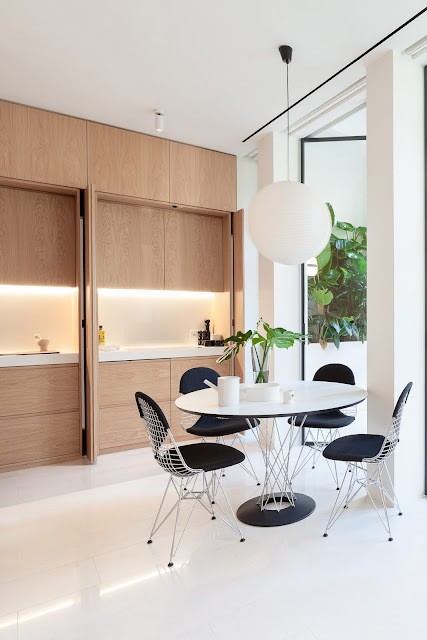 All these zones revolve around this central space, furnished with flexible furniture islands, such as the dining table and the lounge chairs, that compliment each other. 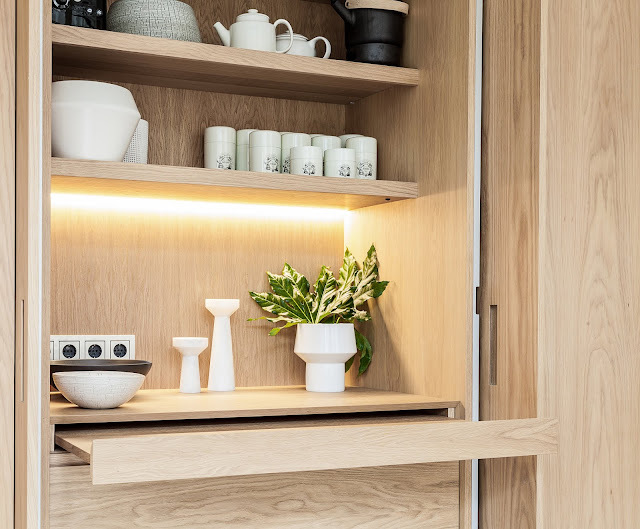 The kitchen spaces are integrated into a perimeter cabinetry in natural light oak wood and provided with sophisticated fittings by Blum. Large concealed doors hide the open kitchen workspaces, finished in white Neolith and natural wood. 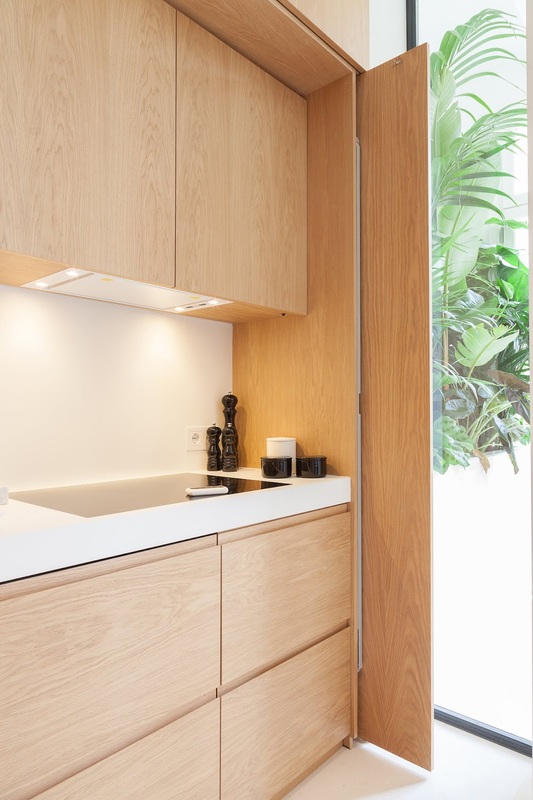 and the large kitchen appliances such as the Novy hood, chosen because of its integration capacity. 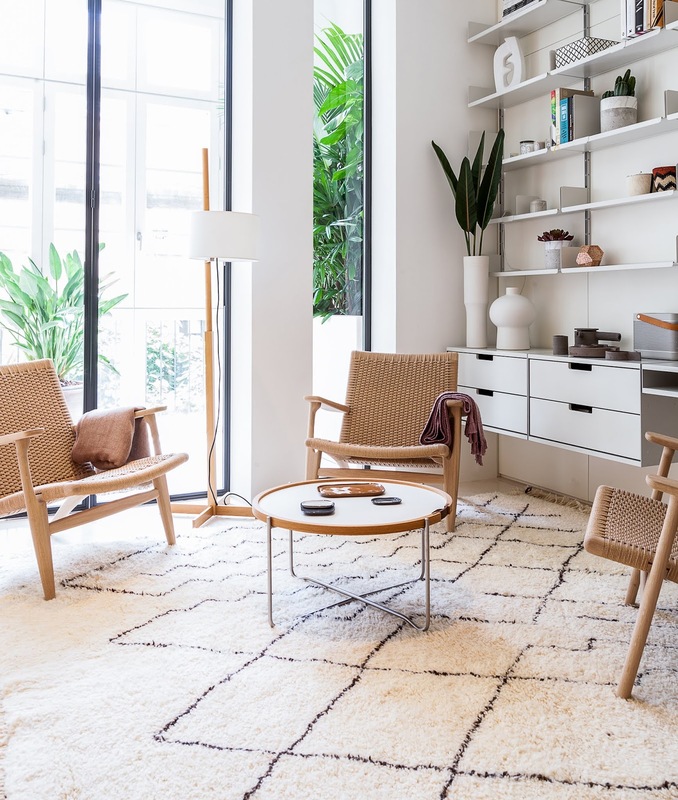 The living room is also divided into an inner zone, furnished with Carl Hansen lounge chairs and table, and a semi-exterior zone in the gallery-garden, furnished with Butterfly chairs and Kettal table. All were delivered by Gunni Trentino and decorated with Serax and Materia Barcelona pieces. In the same way, the office space is divided into a desk area with a computer within the living room shelf system, and a movable desk with storage inside the vestibule area cabinetry. 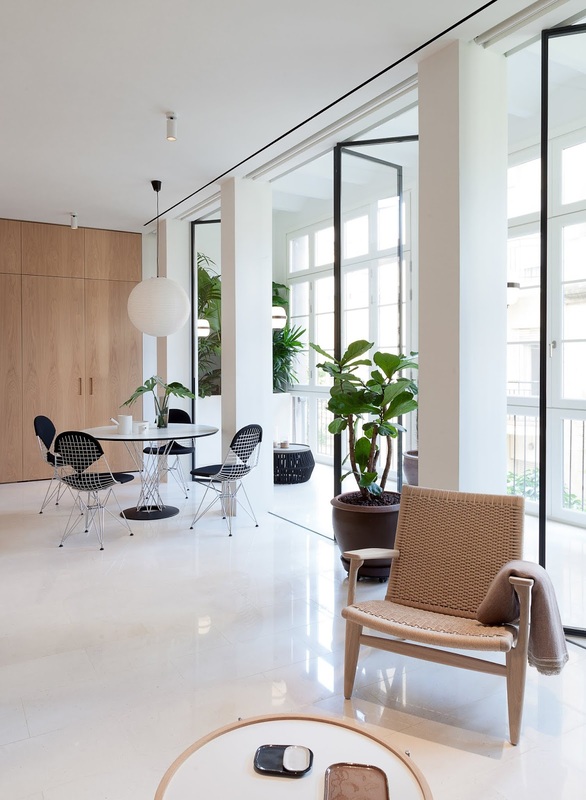 The gallery, featuring double windows both to the exterior and the interior, is also an open use space that can be used in different ways. Two large facing custom built planters, in the same natural sand stone as the floor, contain a lush garden that can be taken care of at a distance thanks to the Gardena Smart watering technology, totally concealed inside the planters. perimeter and in substitution of the partition walls. 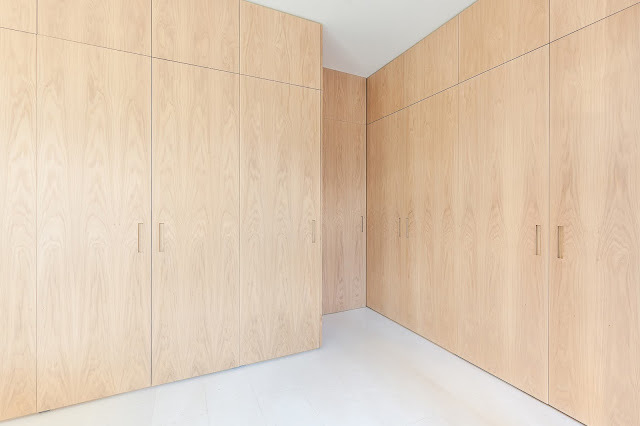 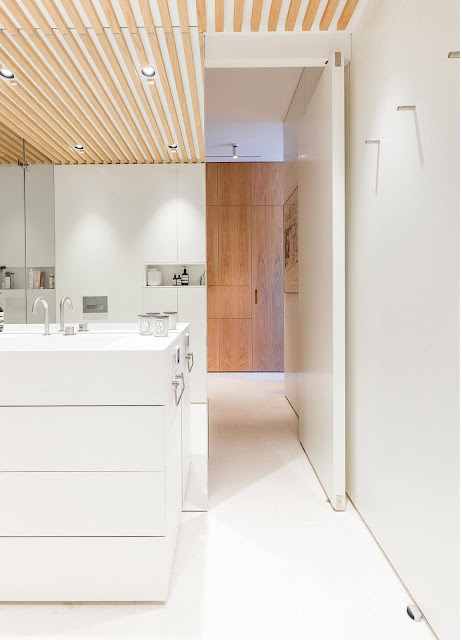 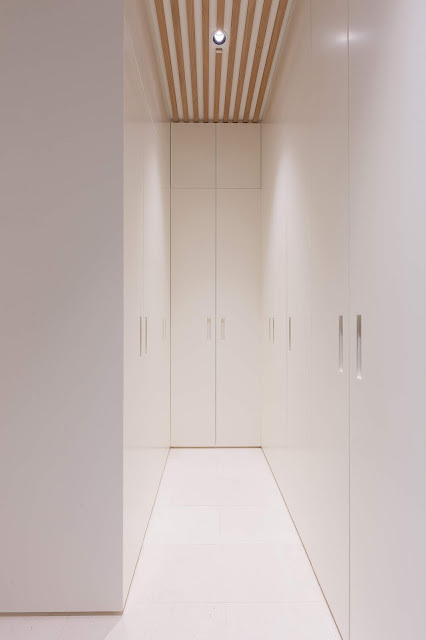 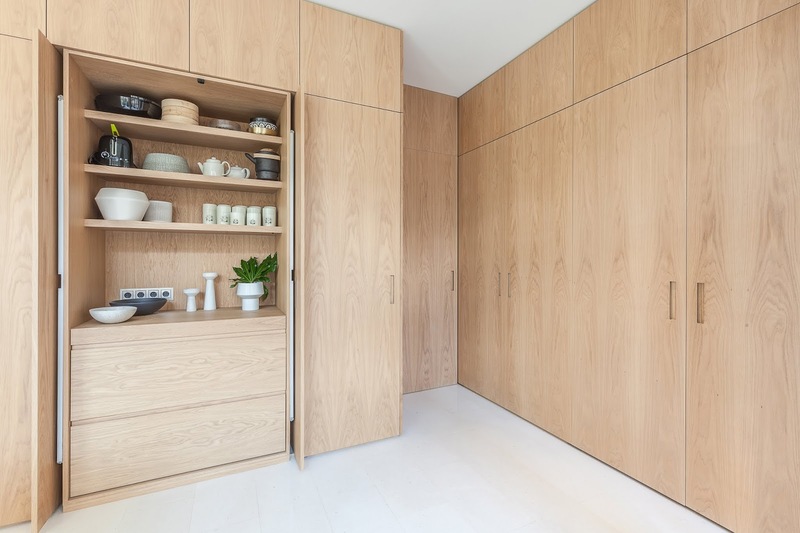 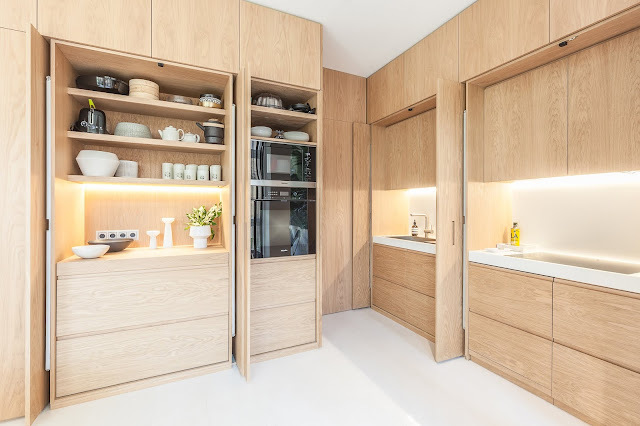 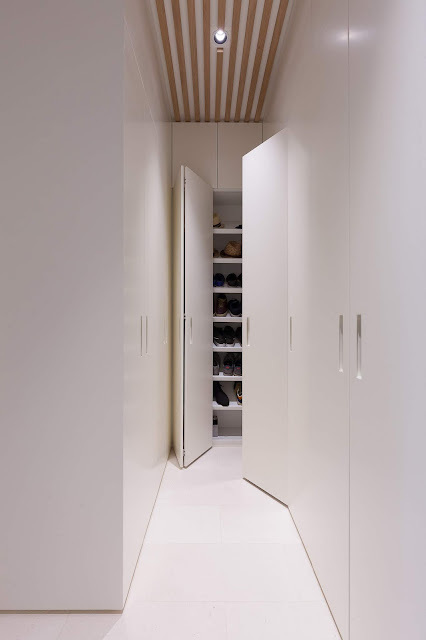 The oak wood cabinets alternate with white lacquer wall clads, that allow for a flush installation of the swinging doors or hide the sliding doors, and indeed separate the different ambients in a subtle way. 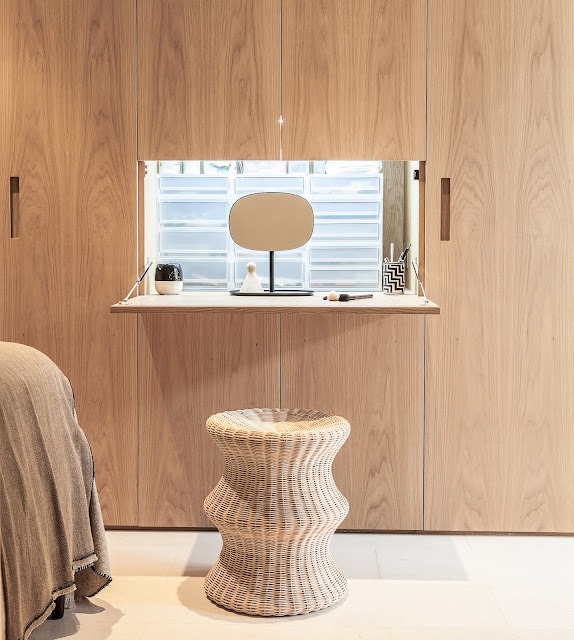 Both materials, wood and lacquer, combine to perfection with the protected natural Capri sandstone by Levantina that reflects the natural light and adds a warm cream tone. 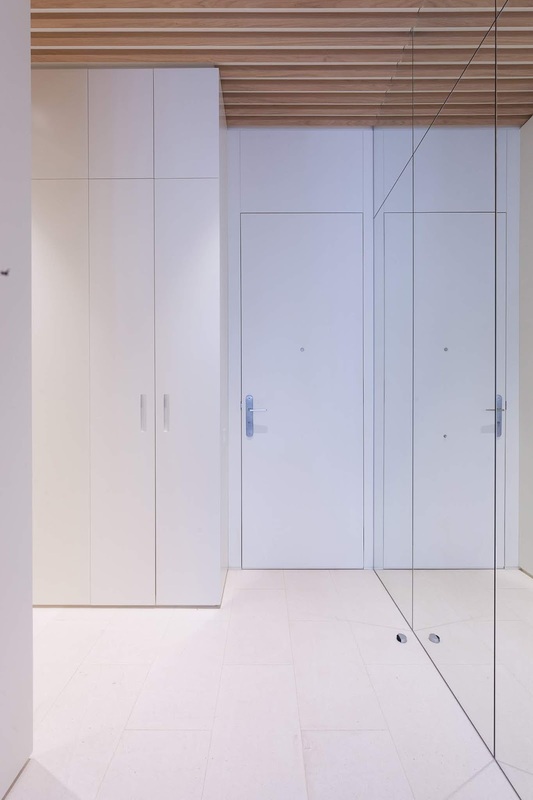 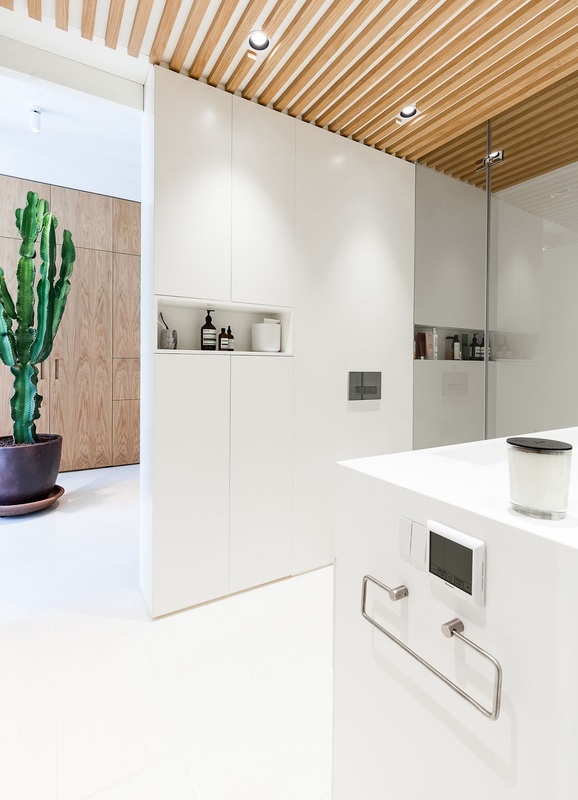 The project features minimalistic designed E22 electrical accessories by Gira that enable an easy control of the lighting system.